Tired of wasting time fixing SQL Server performance problems? Even if you have just a few SQL Servers to monitor in your organization, finding and fixing performance problems can burn through valuable time—especially if you have a small team. SentryOne provides the most actionable metrics available so that you can monitor, diagnose, and optimize SQL Server performance. Stop the cycle of fire-fighting, and gain control of your database performance. 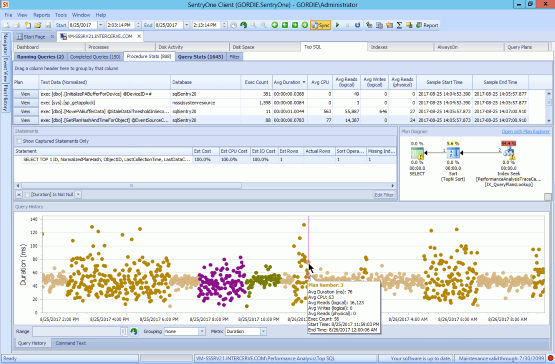 View SQL Server performance metrics in an intuitive dashboard, and drill down to specific areas for further analysis. View the highest-impact queries on the Top SQL tab, including running queries, completed queries, procedure stats, and query stats. You can also see query execution plan diagrams and query history. Stop the deluge of meaningless notifications with Advisory Conditions, which help you watch for the circumstances that lead to performance problems and proactively prevent trouble before it starts. Not a SQL query expert? Not a problem. SentryOne Plan Explorer—included in SQL Sentry Essentials—helps you quickly troubleshoot queries to improve SQL Server database performance. With Plan Explorer, you can conduct index analysis, replay queries to see which operators are placing the most load on the system, and conduct actual plan recosting. Quickly address some of the most challenging SQL Server performance killers—blocking and deadlocks. The Blocking tab displays all SQL Server blocks that occur during a specified time range in a hierarchical format, showing the relationships between all blocking and blocked SPIDs in a blocking chain. 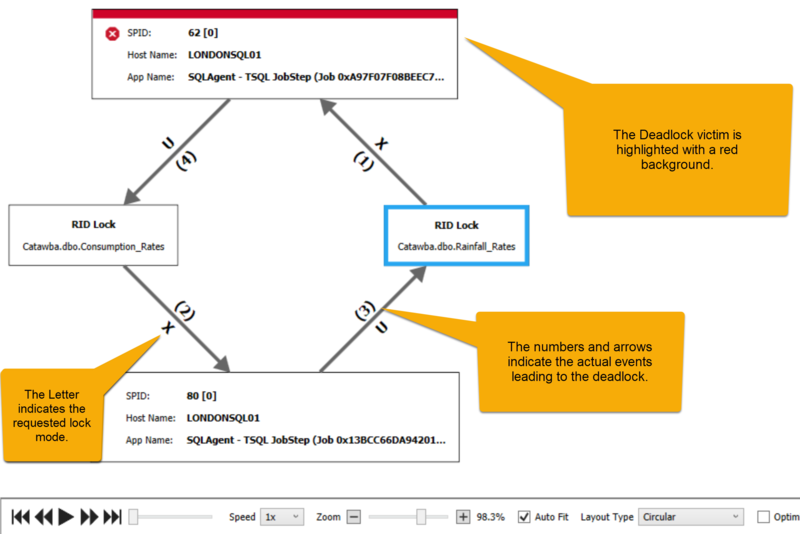 The Deadlocks tab shows real-time and historical deadlocks in your environment, including a deadlock graph that helps you quickly identify problem areas. What is SQL Sentry Essentials? SQL Sentry Essentials is a new edition of SQL Sentry, the top-rated SQL Server database performance monitoring solution. Essentials includes the most useful features and functionality for monitoring, diagnosing, and optimizing SQL Server performance for up to 5 database targets. What is the total cost of SQL Sentry Essentials? SQL Sentry Essentials is available through a perpetual license at $995 per targeted instance, plus an annual maintenance fee of $199, or through subscription pricing for $600 per year. Can I use Essentials if I need to monitor more than 5 targets? No, Essentials is intended for small environments and includes a limited, but powerful, set of features. If you need to target more databases, our sales team will be happy to work with you to determine the most cost-effective monitoring solution that meets your needs. When will SQL Sentry Essentials be available? SQL Sentry Essentials is expected to be generally available in early February 2019. What customer support does SQL Sentry Essentials include?